Growing up in the 50’s/60’s in a home where Gill's father was a photographer was far from boring for Gill! There was a steady stream of journalist friends, scriptwriters and artists as well as parties including a whacky photoshoot on a fire engine with Lord Snowdon! The consequence of her family background meant Gill immersed herself for decades drawing, painting, and taking photographs and creating set designs. She has worked for a myriad of people such as Darius Photography (in the days of Angel Delight! ), potter Betty Sims, and a slight detour designing a hand book for the elderly. Some years later, Gill then trained for five years with silversmith Owen Madhloppe-Philips. Four pieces of jewellery were hired by BBC drama New Tricks and worn by actress Anna Calder Marshall in the episode Objects of Desire. 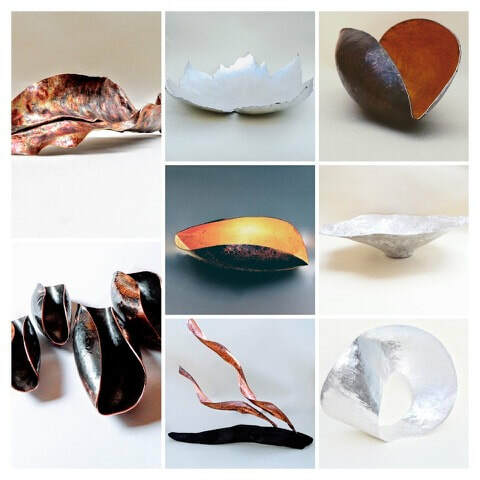 Over the years since, Gill has enjoyed the wonderful design possibilities of pewter and encouraged by The Worshipful Company of Pewters at Pewter Live, winning an award for Design and Collectability, has given Gill the confidence to work on a larger scale making sculptural pieces for the home that includes domestic-ware. Gill has her stamp at the London assay office for hallmarking, and she is also a member of The Association of Pewter Craftsmen. a third party and only contact members and individuals with information about Ashford Visual Artists events and information. All Artwork © 2016 Ashford Visual Artists. Protected by The Copyright Act and the provisions thereunder.